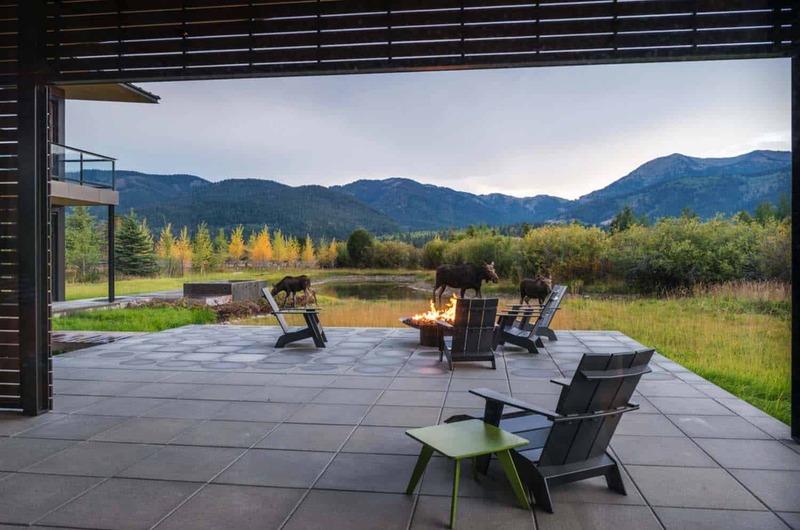 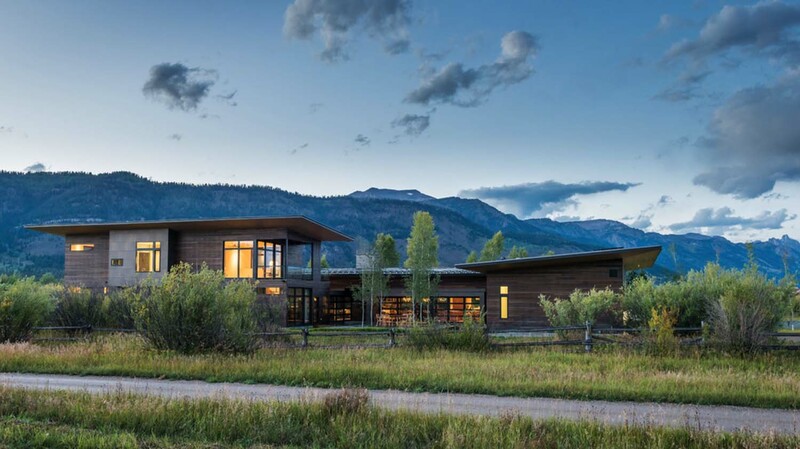 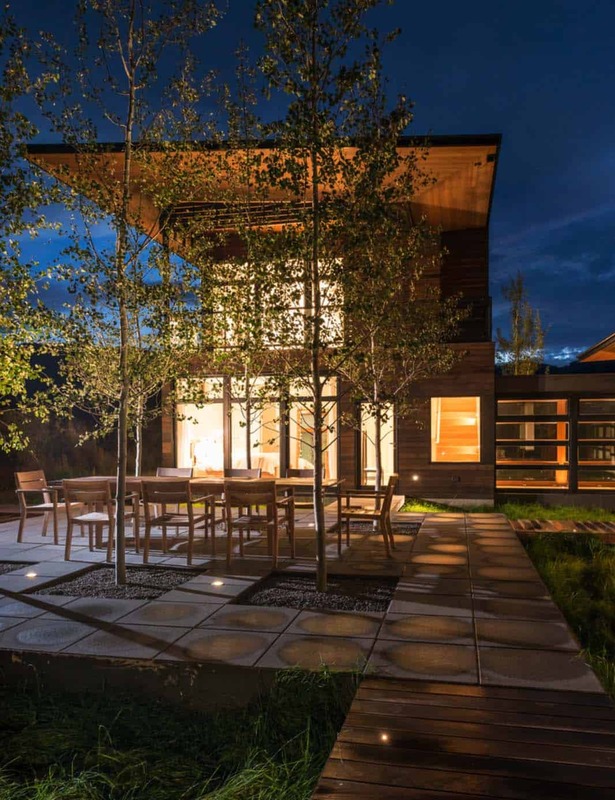 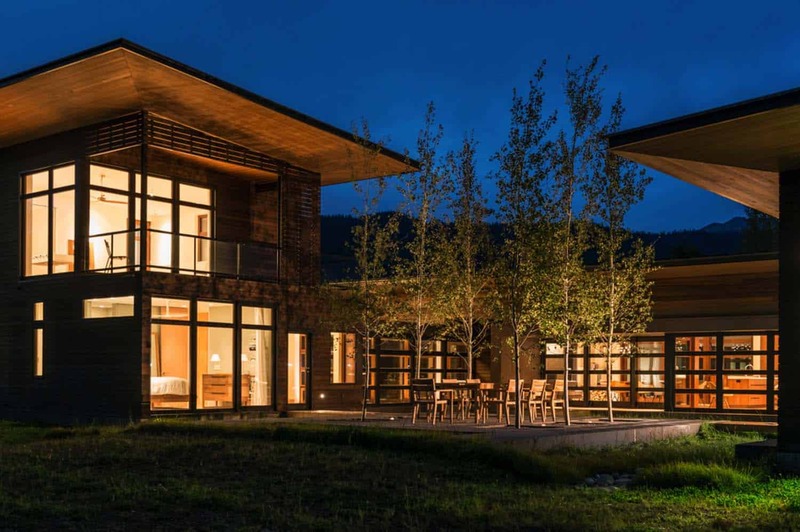 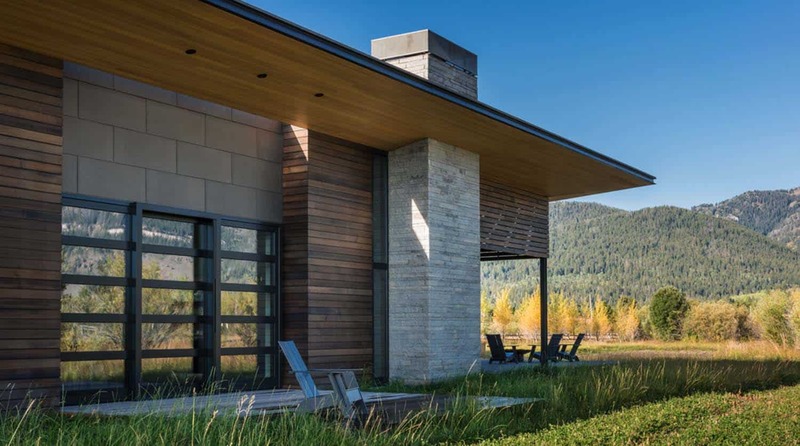 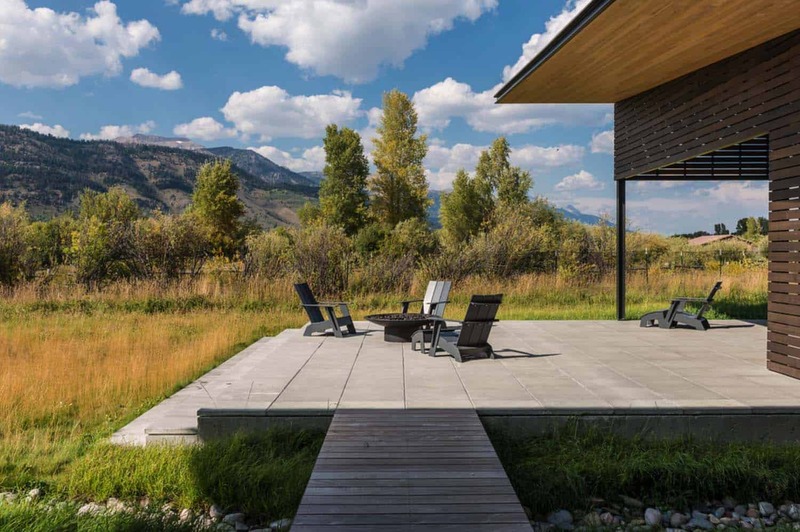 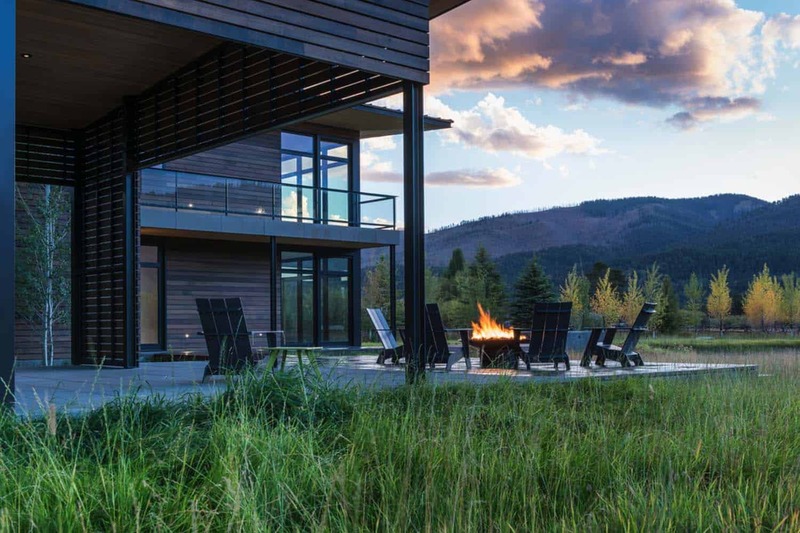 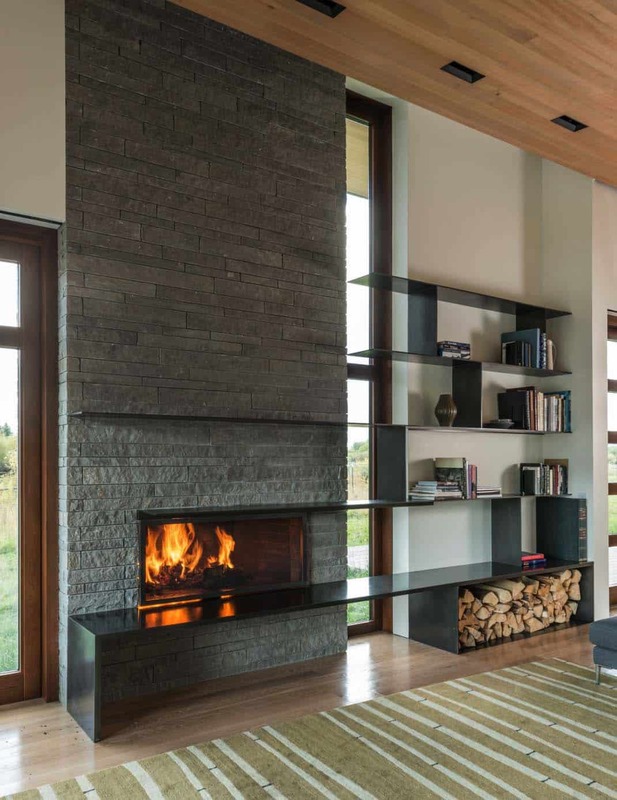 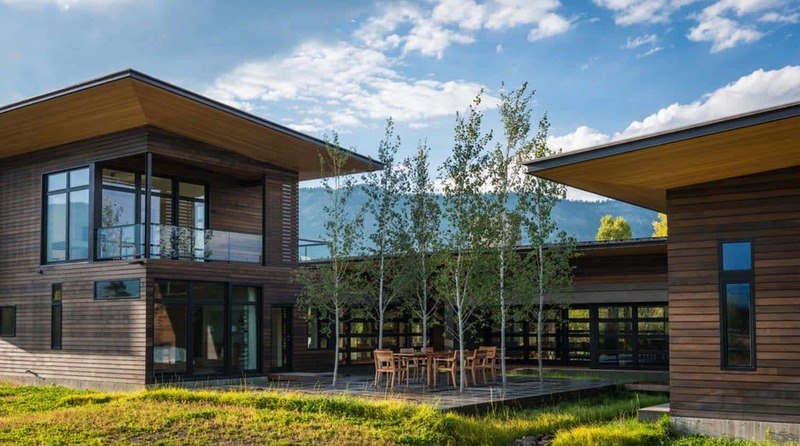 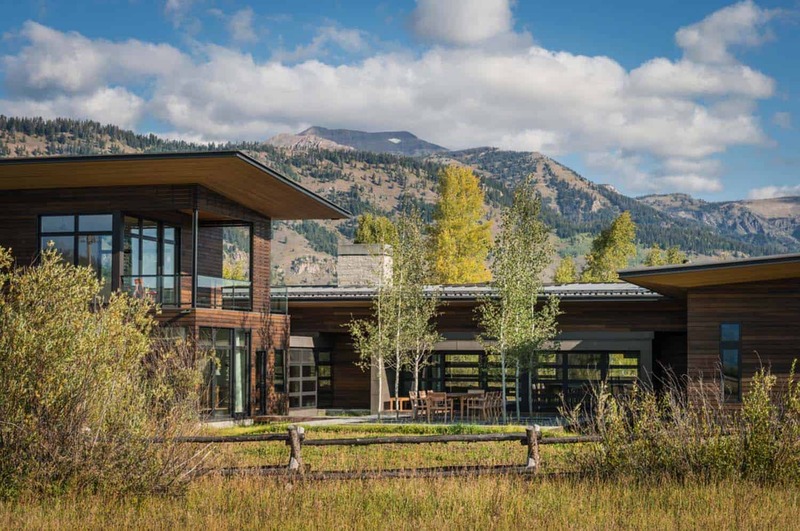 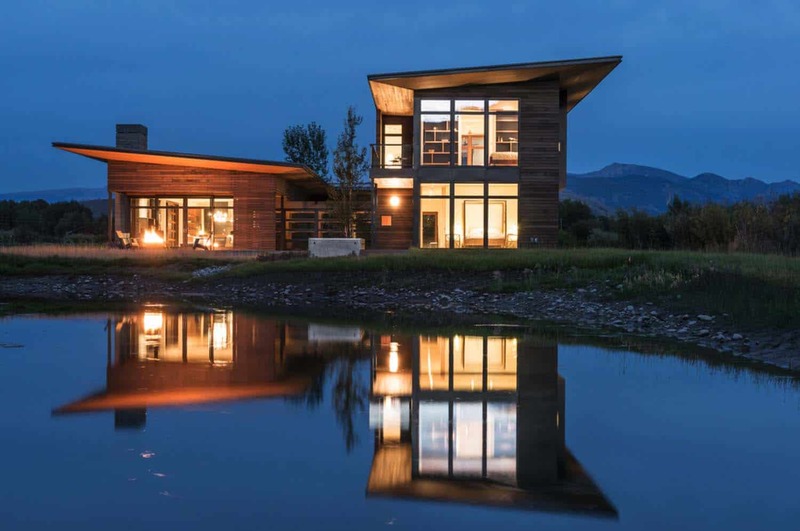 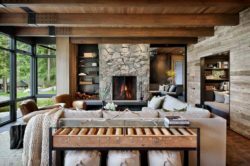 This mountain contemporary home was designed to take advantage of its rugged surroundings by Carney Logan Burke Architects, located near Jackson Hole, Wyoming. 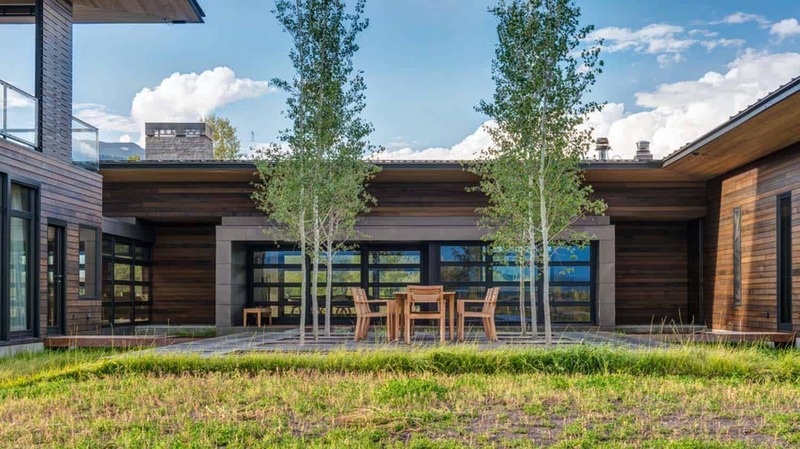 The property is flat, open and grassy, offering expansive views of Glory Peak and the Teton Mountain Range. 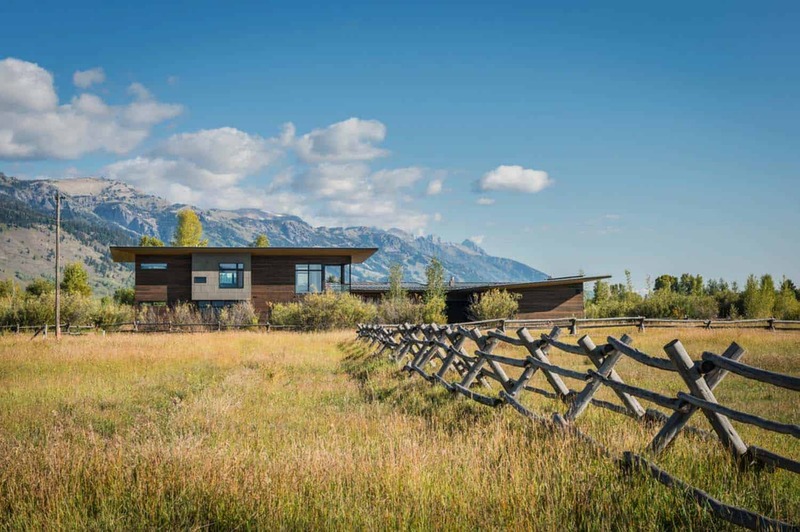 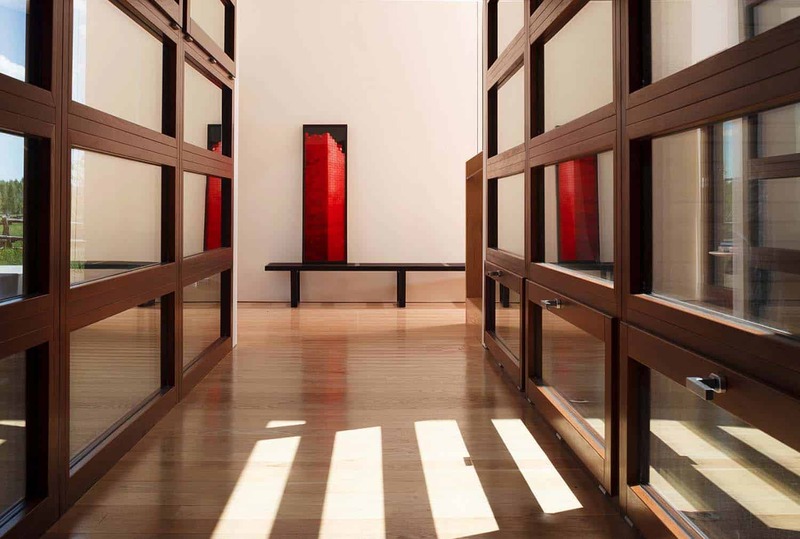 The residence is surrounded by an adjacent 120-acres of wide open space to the south and a dramatic mountainous landscape to the north and west. 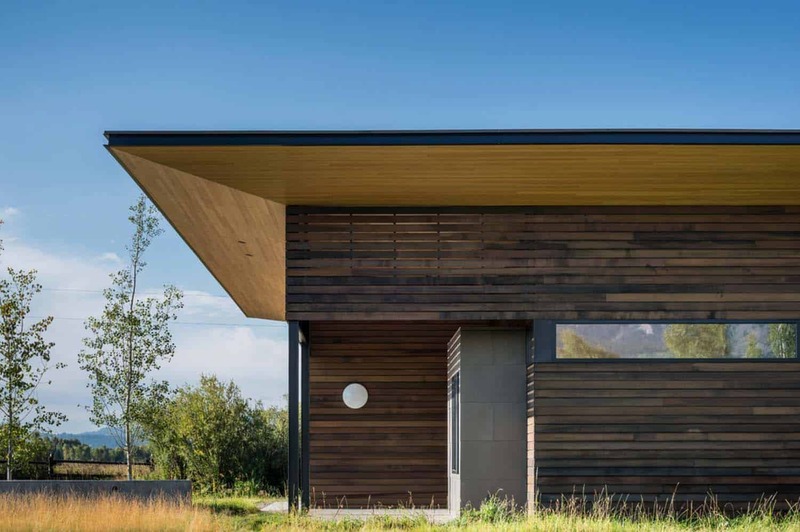 The structure was designed to respond to its site, boasting simple and modest forms that blends into the environment. 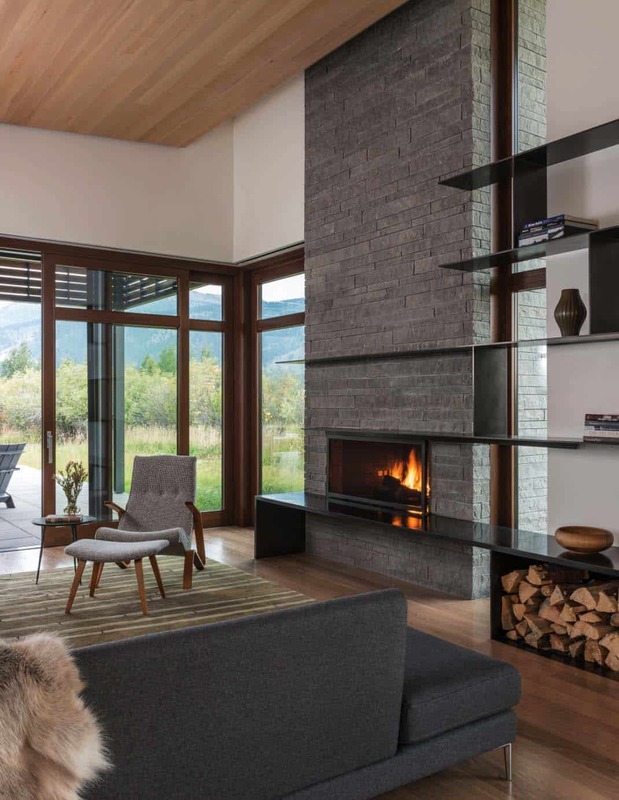 A part-time residence for a family of four, the homeowners requested a mountain contemporary design. 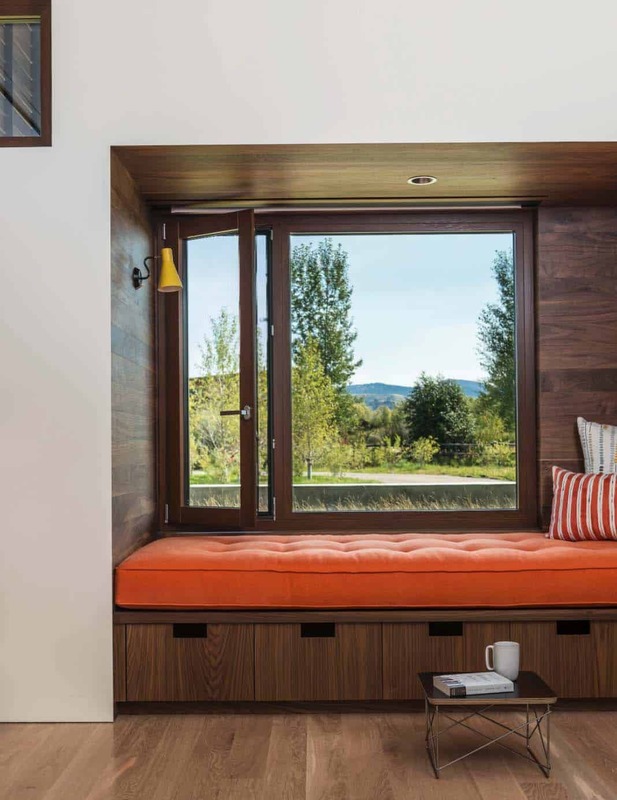 They wished for generous-sized spaces, yet still retain a feeling of intimacy. 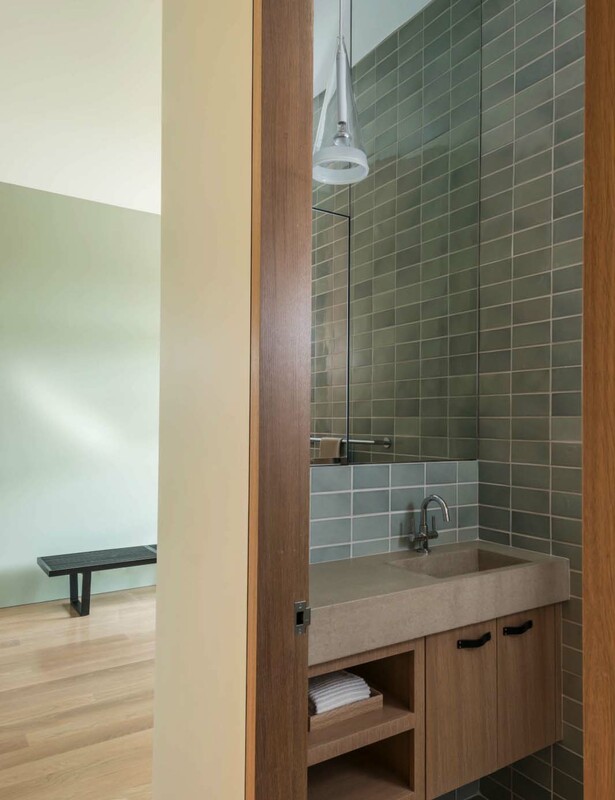 The design team responded by creating a 4,500 square foot program that is both functional and efficient for family living. 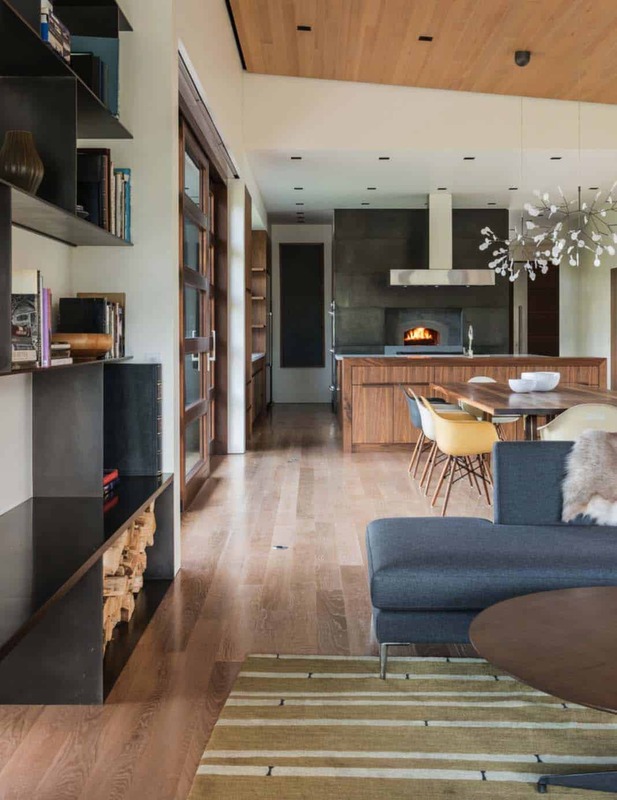 The living environment was separated into two zones to increase family interaction yet at the same time allow for privacy. 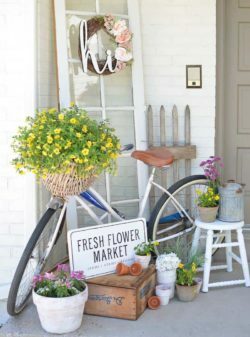 This would also help to encourage a nice flow through the spaces and to the outdoors. 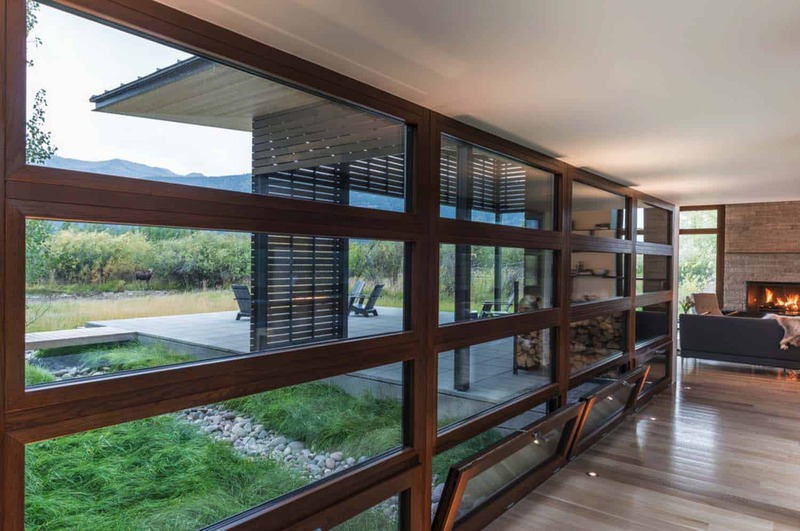 A glass enclosed “bridge” connects the public and private zones of the residence. 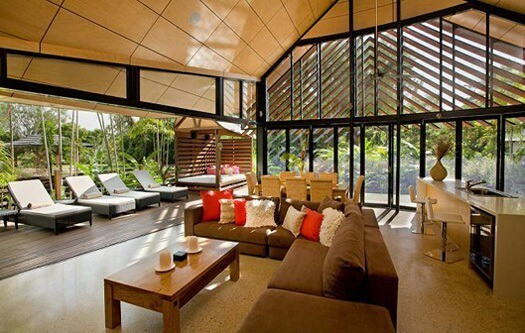 The two wings wrap around a sunlit courtyard. 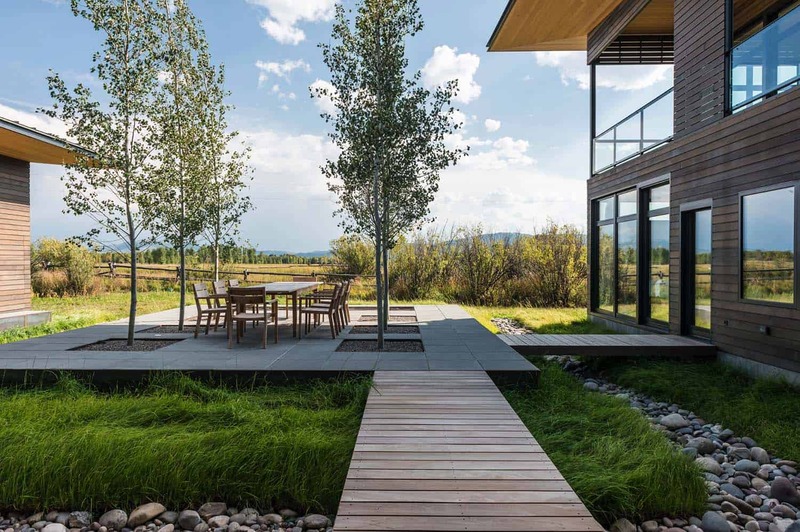 Additionally, an outdoor terrace features expansive vistas of the Tetons and access to a pond. 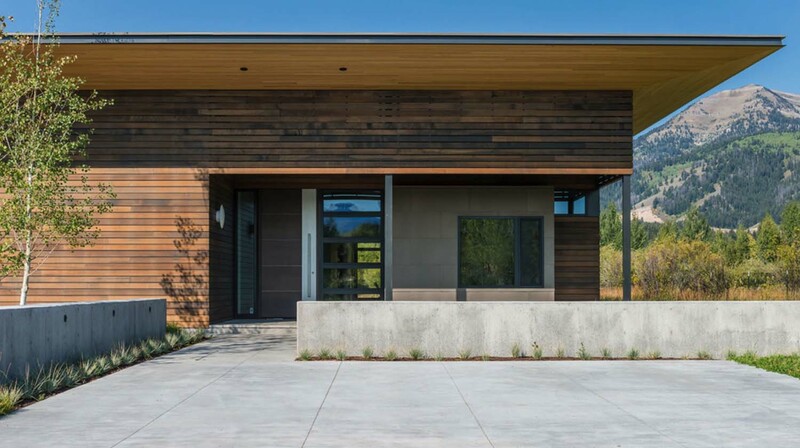 Outside, deep overhangs with a thin profile helps to protect the building from the elements. 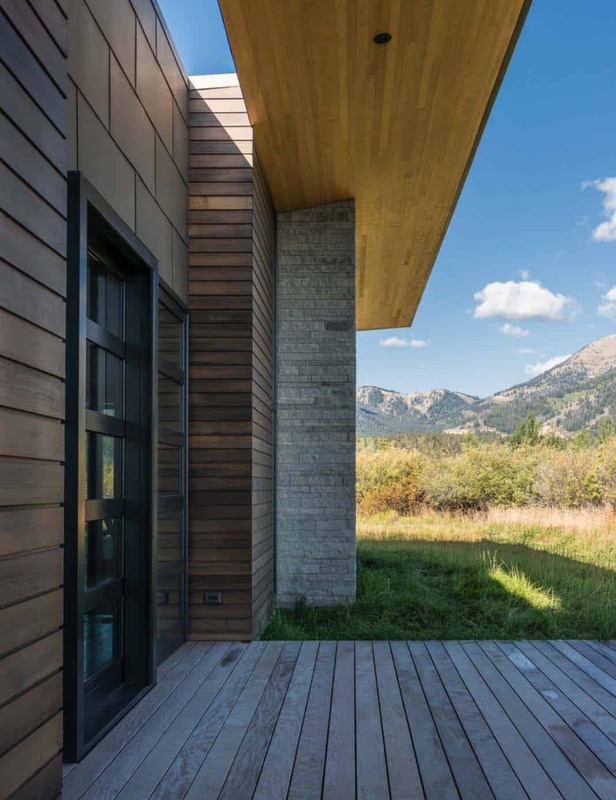 The exterior facade reflects a combination of cedar siding and poured concrete walls. 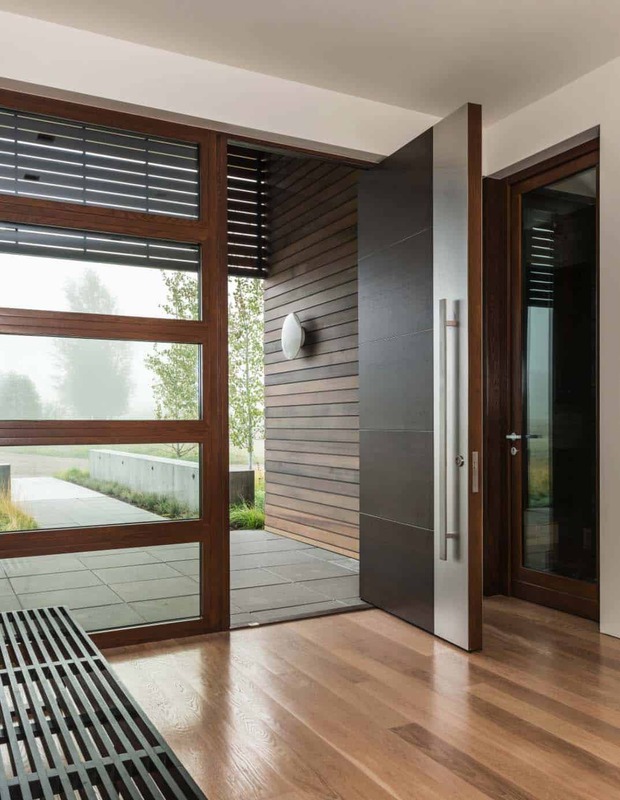 Wood slatted screens creates pattern and depth at the structures entry points. 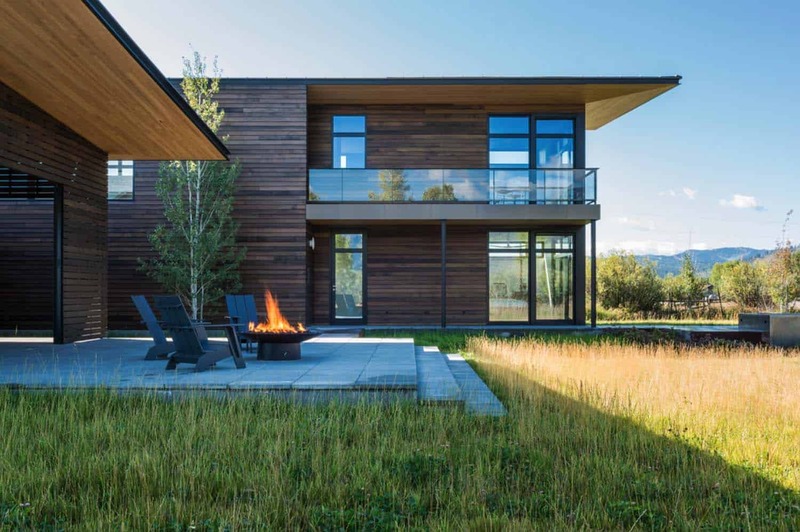 “Bonderized steel panels are used to articulate additions and subtractions to the building form,” states the architects. 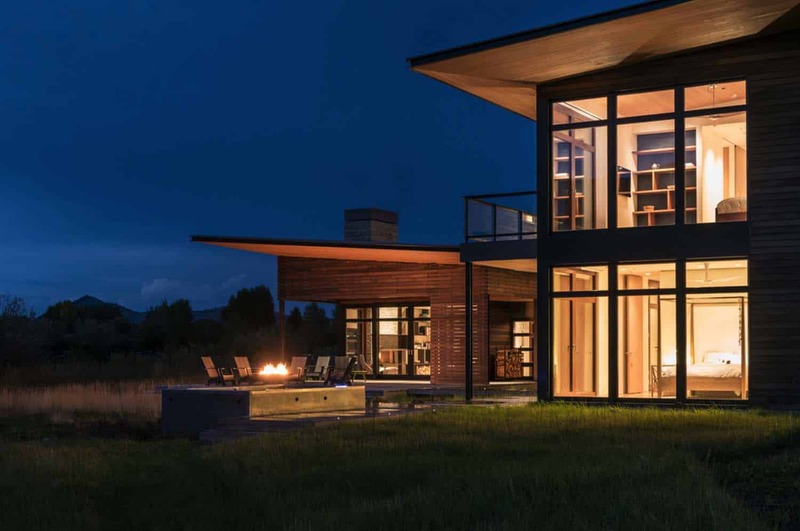 What We Love: This stunning mountain property features breathtaking views and fantastic architecture both indoors and out. 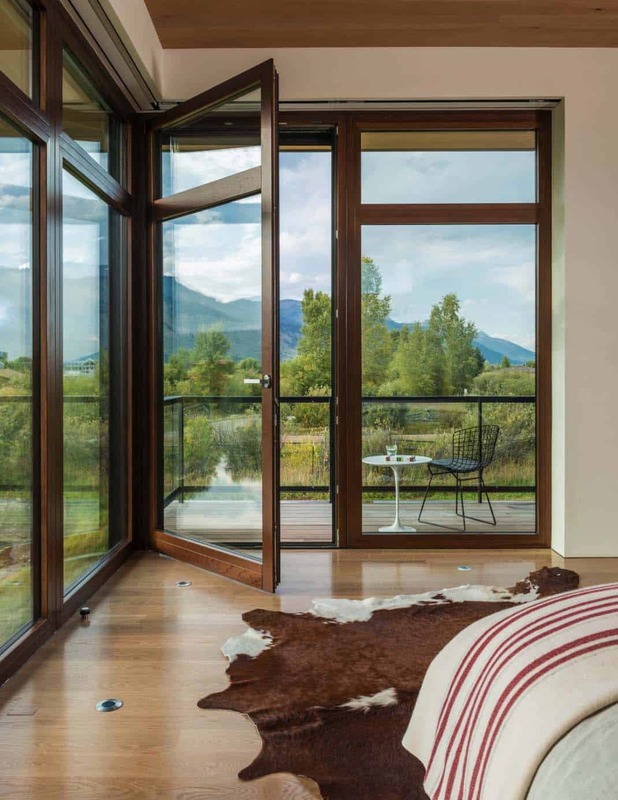 With expansive windows to really bring nature inside, this retreat feels incredibly relaxing. 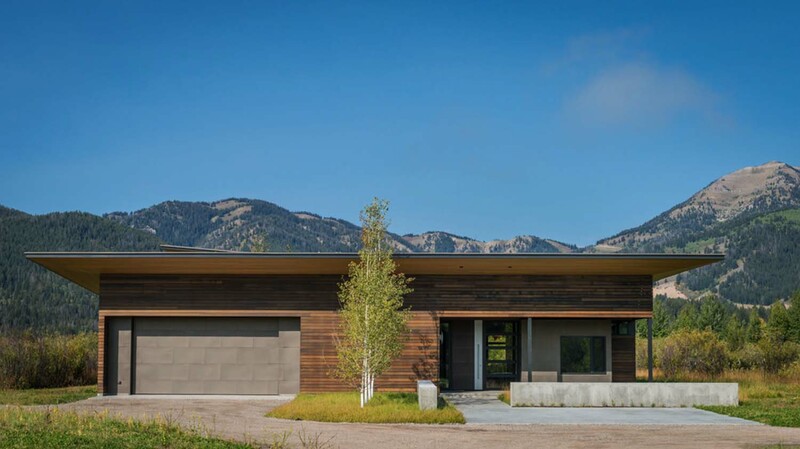 Gently sloping rooflines not only looks great, but mimics the contours of the mountains beyond. 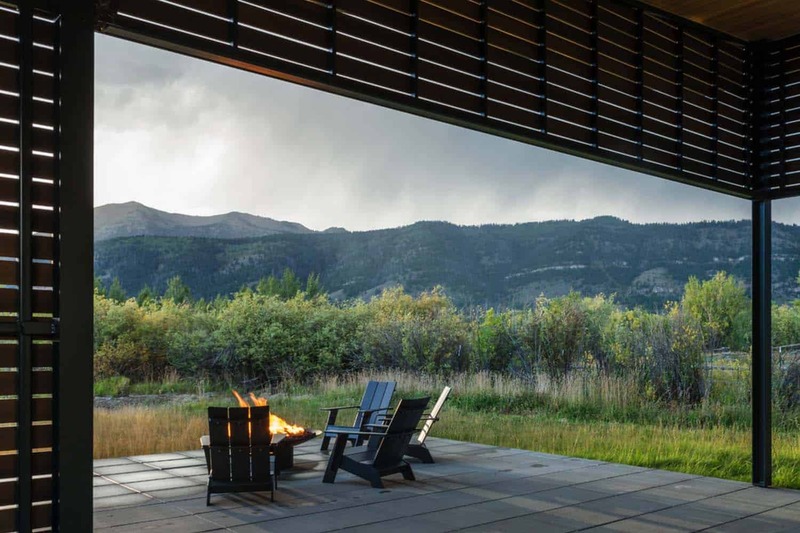 They help with snow buildup in the winter and creates deep overhangs from the harsh summer sun… what are you loving about this cool mountain retreat? 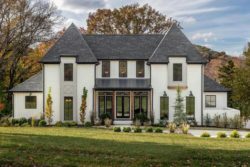 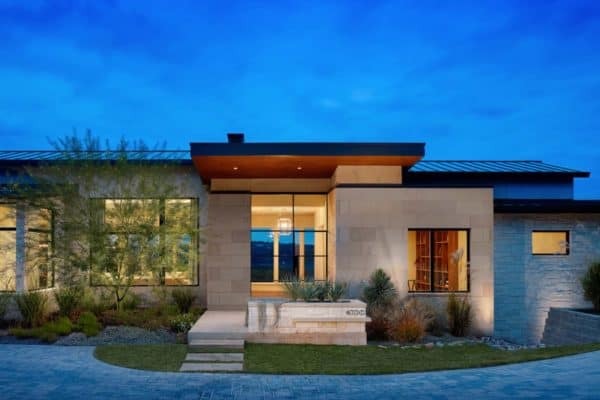 Be sure to click the “Related” links throughout this article if you would like to view more house tours from the architects at Carney Logan Burke. 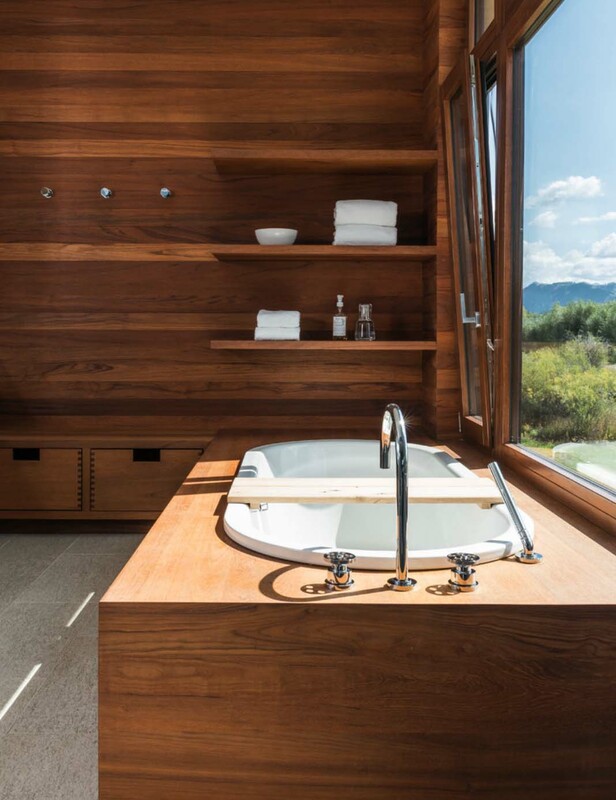 On the interior you will find a simple yet restrained material palette of wood, steel, stone and glass. 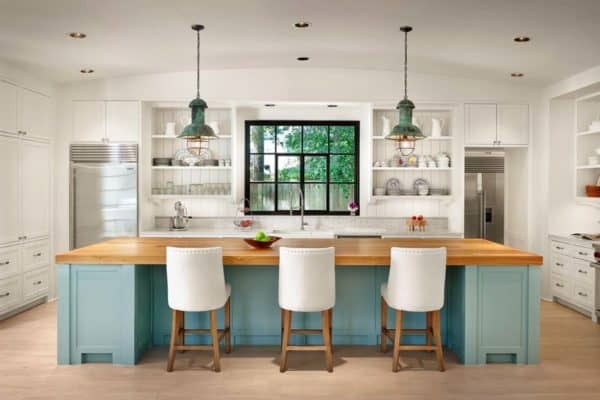 The kitchen is where the family enjoys spending most of their time, so there are plenty of fantastic features in this space. 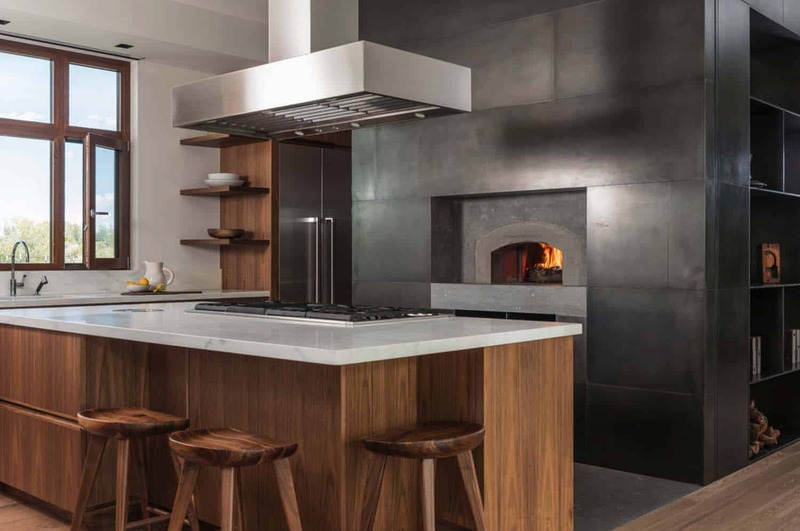 This includes a wood-burning pizza oven wrapped in steel panels. 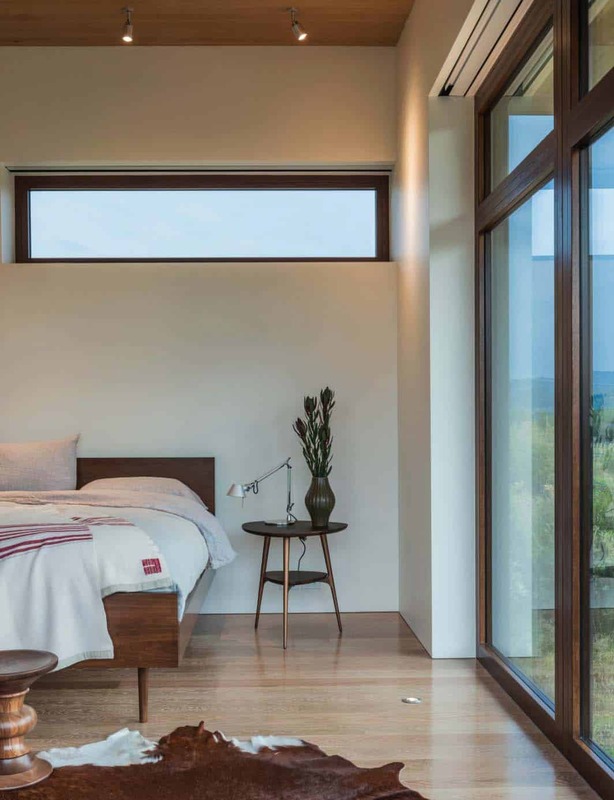 Floor-to-ceiling windows throughout creates a seamless connection between indoors and out. 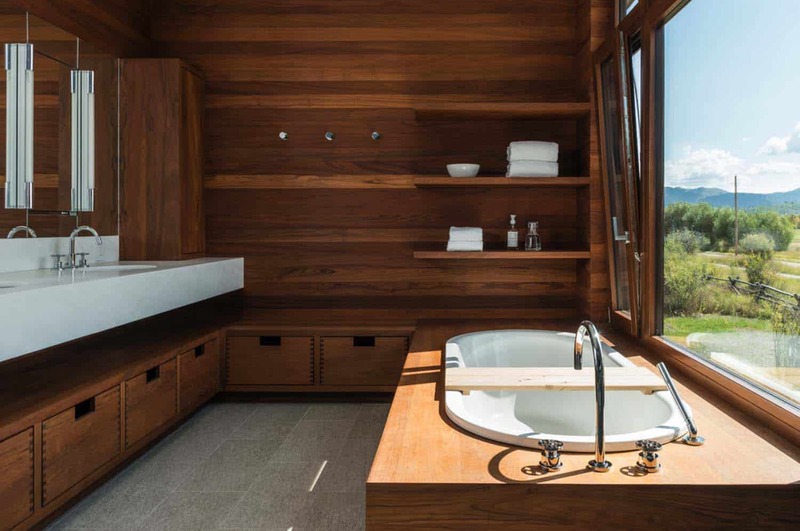 Above: The master bathroom reflects a sophisticated aesthetic, clad in mostly teak. 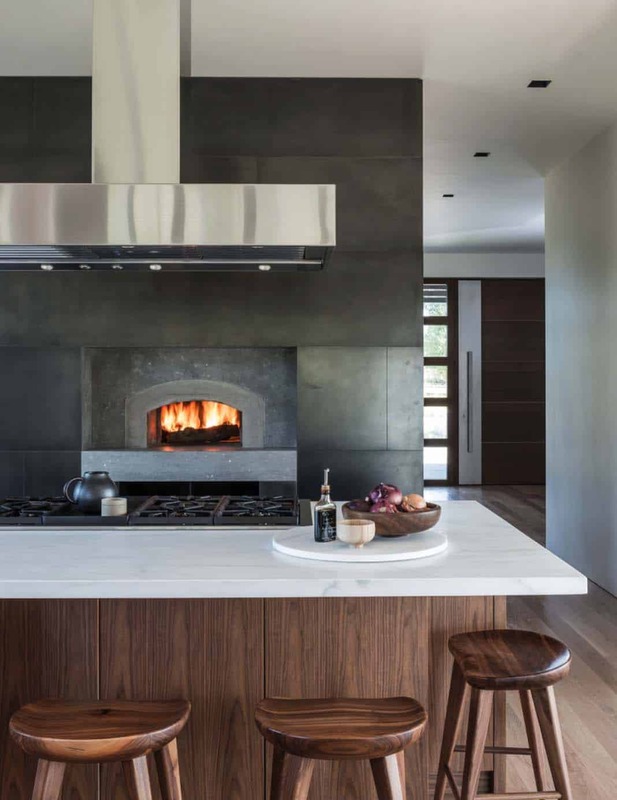 The overall look is modern without being too sterile. 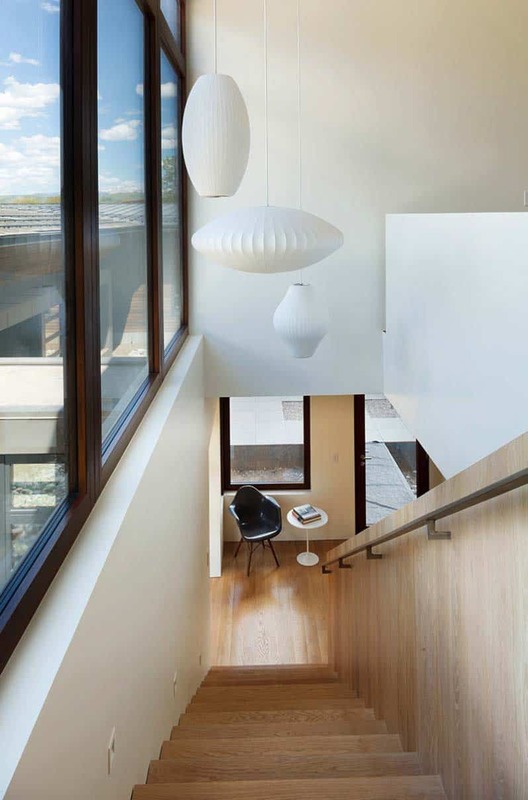 Above: “The main staircase is clad in white oak resulting in a sculptural element without being visually overcomplicated,” states the architects.